Welcome to the Crimea, to the city Sudak. The staff of the private hotel "ASTROMARINE" that is situated on the central seafront of the city 50m from the city beach welcomes you. 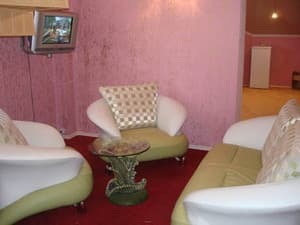 We are ready to provide you with the rooms of "DE LUX" and "VIP" class for you rest. With the close territory and cosy yard, but in the centre of entertainment. All the rooms (except for the econom) are equipped with: a fridge-bar; satelite TV; a mini-safe; security and fire alarm systems; inner telephone; a double bed; soft leather furniture; a wardrobe; a split-system od conditioning; heated floors; a bathroom unit; a minimal set of kitchen utensils; 3 towels; a dressing gown; soup; a tooth paste; a tooth brash; a shower gel; a shampoo; a a bath sponge; slippers; tissue; a hairdryer. 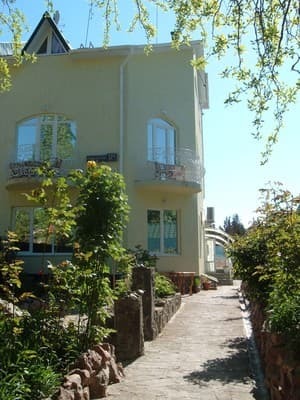 The hotel is situated on the central seafront of the city 100m from the sea. The territory of the hotel is guarded twenty-four-hour. The yard is of close (club) type, the entrance with the help of the entrance door intercom. Description of the room: Standard Superior one-room 3-bed, (1st floor individual exit with its own seating area, equipped with furniture for rest, without balcony) hot water in the room. 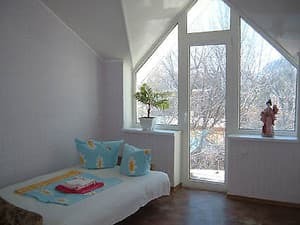 Description of the room: Economy-Tourist - № 8, № 9, № 10, № 11, 2-room apartments with balconies, located on the 1, 2 and 3 floors, bathroom, shower cabin, hot water in the room. Rooms are located in the new (2009 - the year of building) building of the hotel. Each room accommodates up to 4 persons, each additional place is 10 euros, a set of bed linen, towels, etc., table, chairs, set of dishes. Those who stay in the room of this category have the possibility to use a refrigerator, electric kettle, iron and ironing board. 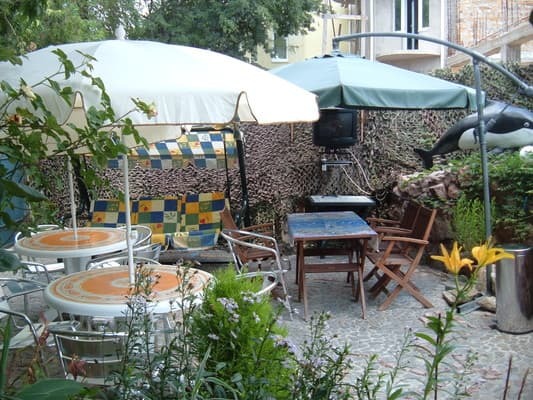 The hotel has a cozy summer terrace with a TV-set, DVD and karaoke. The above rooms are convenient to rent for: tourists, students, travelers with pets (there is a separate entrance to the park). For the animal you must have vet.pasport (or F № 1). Description of the room: Bridal - № 2 on 1 st floor, № 4 on the 2 nd floor, № 6 on the 3 rd floor: all the rooms = 21.5 square metres. Bathroom - 5.1 square metres. Rooms can accommodate 2 persons (double bed), can be + a baby (on the sofa of length 1.2metres) extra payment for places is 10 euros. All the rooms (except economy) are equipped with: fridge-bar, satellite television, mini-safe, burglar and fire alarm system, internal telephone, 2 double beds, soft leather furniture, cabinet, split system of air conditioning, heated floors; bathroom; minimum set of dishes, three towels, bathrobe, soap, toothpaste, toothbrush, shower gel, shampoo, washcloth, slippers, toilet paper, hair-dryer. 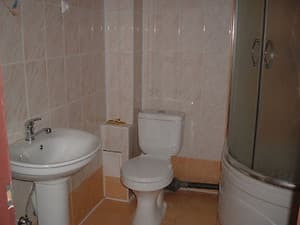 Description of the room: Studio - № 1 on the 1 st floor, № 3 on the 2 nd floor, all the rooms = 40 square metres, toilets - 7.4 square metres + (bidet, shower cubicle with hydromassage). 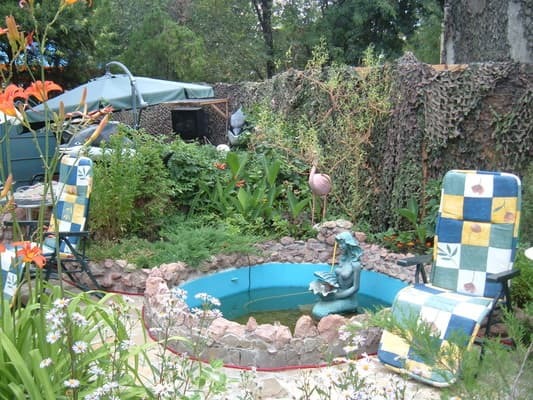 Room can accommodate 2 persons (double bed) and a large sofa french cot, 2 more people can be accomodated. Payment for each additional place is 10 euros. № 3 with two balconies. All the rooms (except economy) are equipped with: fridge-bar, satellite television, mini-safe, burglar and fire alarm system, internal telephone, 2 double beds, soft leather furniture, wardrobe, split air conditioning system, warm floors, toilets, a minimum set of dishes, three towels, bathrobe, soap, toothpaste, toothbrush, shower gel, shampoo, washcloth, slippers, toilet paper, hair-dryer. Description of the room: Penthouse - 39 sq. 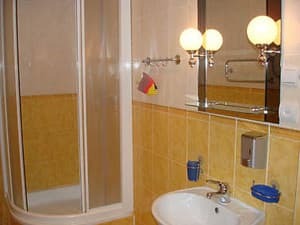 M. A bathroom - 5 sq. M. Three-room suite in two levels with a view to the sea, 2 bedrooms and a drawing room. 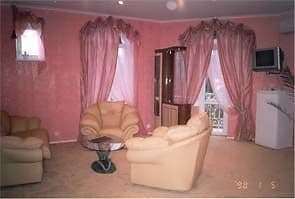 The room can accommodate up to 4 people. In addition, you can place a small child (on a 1.2 m long sofa) with a surcharge. The rooms with the possibility to put extra 1,2,3 plcaes are for additional payment. In case of accommodation into the room less persons than the room comprises the payment for the room is not recounted. Children under 4 without givinh the extra place are accommodated free of charge. 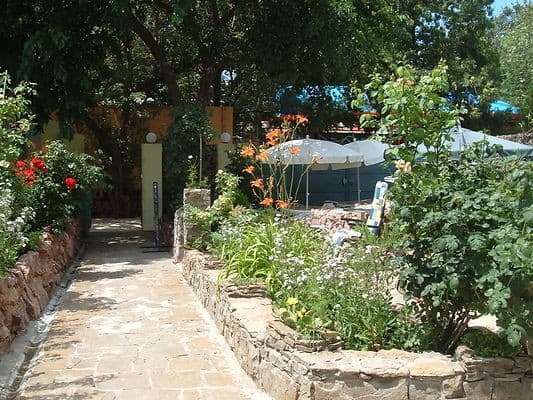 The Crimea, city Sudak, Tenistaya avenue 17a. The way: by regular buses, fixed route taxi from Simferopol, Feodosiya, cutter - from Feodosiya, Alushta, Yalta. There is a possibility of transfer to ASTROMARINE.